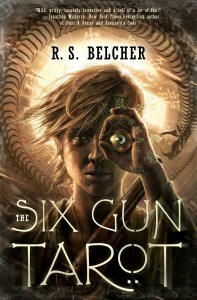 The Six-Gun Tarot is a pretty mind-blowing book. It incorporates a million different ideas and tropes (for instance, the Christian creation myth, Native American myth, Chinese myth, horror, ghosts, angels, an order of assassins, the American Civil War, early Mormonism, the plight of women and gay people in the 1800s, romances), all within a small Nevada town (with all the trappings of a proper Western). It chronicles the inception and rise of ancient evil and the forces arrayed against it. It also introduces a ragtag band of heroes, each with their own complex backstories – even minor characters are three dimensional. And it does all this in under 400 pages, and it works! Golgotha is a town in the middle of the Nevada desert, next to an abandoned silver mine. Somehow, Jim Negrey, a fifteen year old boy who’s running from his past with his father’s fake eye in his pocket, ends up here. He soon discovers that Golgotha is no ordinary town – things that are normal in Golgotha would be exceptionally strange anywhere else. And then there are the people – the seemingly immortal sheriff Jon Highfather, his half-Indian, half-coyote deputy Mutt, the banker’s wife Maude, who seems like a proper lady, but isn’t, the upstanding Mormon mayor who has more than his fair share of secrets, the local inventor Clay, who has a strange obsession with death… the list goes on. The story takes place via many different viewpoints, but also alternates between time periods. One would think that this would be very confusing, but it works very well. As the threat in Golgotha unfolds, we learn more about how the threat came to exist. I really enjoyed the in-universe creation mythos, especially the portrayal of the Christian God. However, the “everything is true” mindset did get a little frustrating at times, since I didn’t really know what the “rules” were, and stories where absolutely anything is possible grate on me a little. 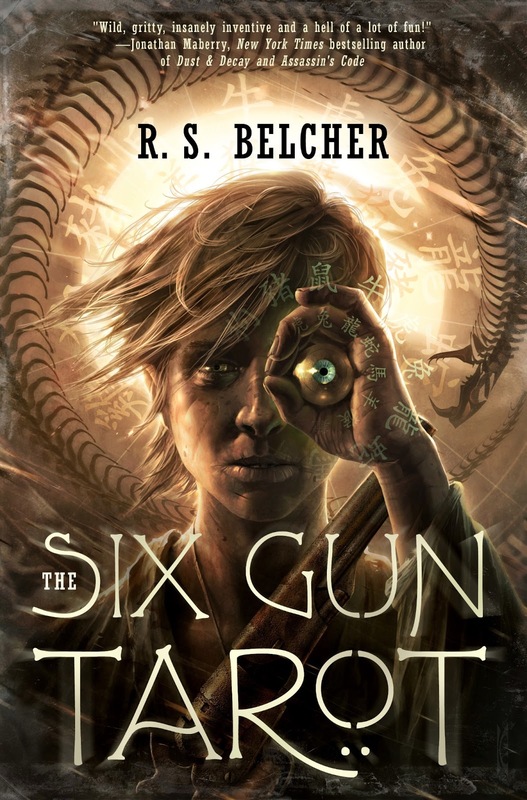 The Six-Gun Tarot definitely has some problems – some very cheesy rituals of the Dark Side, a few too many characters, so even with Belcher’s magic character depth powers, some still come off as bland. The magic system was confusing to me – I would have liked some explanation there. However, my biggest problem was that I can’t imagine where the story goes from here. The mythos established here is so vast and complex – I would love to see more novels set in Golgotha, but this book tackled such a huge story that anything that comes after it runs a huge risk of being insignificant (or making the events of this book seem unimportant). Some Golgotha short stories would be awesome, though. All in all, a great genre-bending book! Read it! This entry was posted in Books, Reviews and tagged fantasy, fiction, western by Kriti Godey. Bookmark the permalink.